Thanks to Johnson & Johnson for sponsoring this post! Bath time is one of the sweetest parts of our day and has always been a time for Alessandra and I to bond. I remember in the first few weeks after she was born, I was so nervous to bathe her because she was just so tiny and fragile, but a few great mom to mom tips later, I got the hang of it and ever since, it’s been a special time for us. Bath time should be one of the highlights of your baby’s day! Whether it be a time to relax, or a time to splash and play, making it enjoyable for your little one will reap big rewards, whether it be a better sleep at night, or building trust and a closer connection between the two of you! I’m going to walk you through our bath time routine and essentials and hope this helps new parents who are figuring it all out! a. 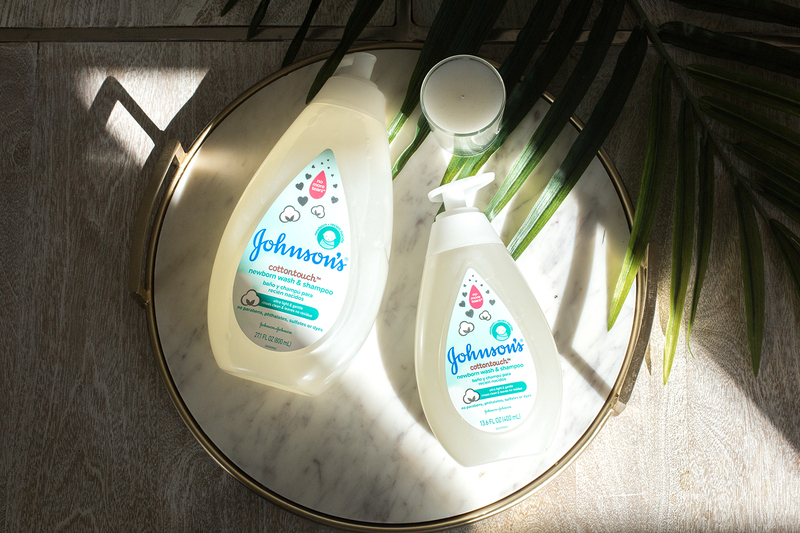 Baby shampoo: I love Johnson’s classic No More Tears Baby Shampoo (it’s what my mother used on me as a baby) and lately have also started using Johnson’s new CottonTouch Newborn Wash and Shampoo, which is extra gentle on the skin and hair and smells heavenly! b. Baby conditioner: I like Johnson’s No More Tangles Conditioner! Now that Alessandra’s hair is longer and curly, it’s important to detangle as much as possible before brushing. c. Baby body wash: We’ve been using Johnson’s CottonTouch Newborn Wash and Shampoo to wash her body and I’ve noticed her skin has been extra soft ever since! d. Cup for rinsing: it’s easier to wash suds off this way! e. Baby wash cloths: When she was very little, I would put these over her in the tub so she wouldn’t be chilled! Now we just use them to gently wash her body and between folds. g. Baby lotion: Maintain your baby’s soft, delicate skin with a gentle baby body lotion like Johnson’s CottonTouch Newborn Face and Body Lotion! As a new parent you want to know exactly what goes into each product you’re using on your baby. You can read more on Johnson’s safety measures here. 2. Before placing baby in the water, test the temperature to be sure it’s not too warm or cold. Some baby baths come with thermometers, which is really helpful especially when babies are very small! 3. I like to start by washing Ale’s body first. Face to toes. Pay attention to folds and creases. I like to use a soft baby wash cloth and Johnson’s CottonTouch Newborn Wash. I apply the wash in gentle, circular motions and she’s usually busy splashing around during this process! 4. Rinse off body with warm water in your cup. 5. Next, wash hair with baby shampoo! As I mentioned above, I love Johnson’s No More Tears Shampoo because it’s gentle and if a bit happens to get into her eyes, it doesn’t hurt or sting! Johnson’s new CottonTouch Shampoo is also just as gentle and makes Ale’s hair smell so amazing I just want to sniff her all day! 6. Rinse with cup. I try to use my hand to block her face and avoid too much water and shampoo from getting into her eyes! 7. Repeat process with baby conditioner! 8. Immediately wrap baby in hooded towel and thoroughly dry hair after bath! 9. Apply baby lotion and gently massage into skin, with soft, relaxing strokes. Alessandra has gotten dry skin in these colder months, so I’ve been applying Johnson’s CottonTouch Newborn Face and Body Lotion to her face and body every day and have noticed a vast improvement! 10. Apply diaper and get baby dressed! And that’s it! Hope this step by step takes some of the guess work out of the baby bathing process! I know you all said on my Stories you’d love to see more mama/baby content so Gabriel and I have been brainstorming some fun ideas…would love to hear from you too though! What kind of family content would you like to see next? Thanks always for stopping in! How adorable!! Ale is too cute! Thanks for reading girl! And yesss I can’t believe it! She’s going to be 1 in a few days! I swear by J n J products since the day my daughter was born! omg, your baby is adorable! My mom says Ale looks like an angel! Ahhh we can’t handle it sometimes lol!! Especially after bath time!! Your baby is sooo lovely and adorable ! Look like such a great shower routine moment. Ah thank you love <3 Bath time is our favorite :) Hope you're off to a great weekend! this is so sweet! I love that that classic baby soap (and smell!) keep going on and on! She is adorable! The photos are beautiful. She’s such a cute pie!! I always gift my friend’s baby Johnson’s baby products. They are the best! What a beautiful post! Love the photos dear, super adorable! Ale is getting so big! And those eyes- too pretty! I just cannot- she’s so cute! Alessasndra is such a cutie! She’s adorable… Have a beautiful day.